While this year’s holidays brought colder temperatures interspersed with heavy downpours, the aftermath was clear, sunny skies. Heading out from the beach cities one can see snowcapped mountains and breathe fresh air. Here are two very special petite boutique retreats that have been upgraded to more elite status, where one can chill out and get toasty at the same time. If you want to be in the center of town within walking distance of all the hot spots, but also have your privacy, The Avalon Hotel and Bungalows is the perfect spot. For fans of the authentic Spanish architecture from the Golden Age of Palm Springs, this old-world hideaway has a history. When you step into the entry you feel immediately ensconced into the tasteful design elements of the Hollywood Regency decor. If you have a penchant for design hotels, Kelly Wearstler has done wonders to transform this four acre property, with maze like manicured gardens into a tasteful setting. As the style maker of note, especially for her bespoke design elements, it is a delight for all the senses. Stepping into a bungalow suite for the first time, you are hit with the intense whiteness, like glacial snow with contrasting elements, including the crystal glass-lined fire place and burnt orange flames. There is something magical about a white on white space, framed with touches of black especially when centered on the small bold wall/ceiling stenciled eating area. The blinding purity of the super-white space is intoxicating when reflective elements of silver, paired in the crystal light fixtures, mirrored tables and hardware on the cabinets. This is a lyrical play of light and dark. Each time you enter the space, you are lifted up. For many of us, escaping the the monotony of a beige world outside is exciting when most places are reminiscent of the Spanish adobe styles. The property is designed to create intimate spaces, with each little vignette for seating, as well as a couple of swimming pools, fountains and citrus trees to shield you from the sun. Since it was cold outside, the best way to get R&R was at the Estrella Spa. It’s a petite retreat with the same stylish touches. A lounge with a fireplace, a perfect cozy spot for a lazy afternoon before or after your treatment. The spa menu is limited but what’s more important is the incredible healing hands of the masseuse and facialist. Oftentimes one might go to a fancy spa with all the bells and whistles but the bottom line is the talents and skills of the practitioners. This is definitely worth the time and experience. Some of the rooms have their own fireplace too, so you can be comfortably warm. For the epicure palate, Chi Chi restaurant hits the spot, with an indoor dining room right off the main lobby entrance, which serves all meals. The food is fresh, healthy fare with some unique spins on California Cuisine. But the most charming are the two little outdoor spaces, one that is along the main pool and the other, more cozy and private is an intimate outdoor lounge with a Moroccan themed dramatically lit effect at night. If you want to go out on the town, you are in walking distance of the main drag, Palm Canyon Drive and can be in the limelight in a matter of minutes. There’s even a gym and yoga classes offered, so check out the schedule. However, staying put, with the twinkly lights and charming garden vignettes, you will find this a romantic setting for stargazing. Top Tip-This is a dog friendly place so you can include your favorite Fido in the getaway. If you’re seeking a special hideaway with the feel of a bed and breakfast, check out the ambiance at The Chateau at Lake La Quinta. This is a unique experience, especially while getting access to the views of this tony enclave of exclusive, elegant residential lakeside properties. This chic boutique hotel is nestled alongside with scenic surroundings, and charming, tastefully appointed hotel rooms. In fact, the beds are so comfortable and the views are so lovely you may not want to leave the room! You can step out for a breath of fresh air onto your private patio, and enjoy the upfront view. Casually elegant design, matched with top of the line accoutrements makes this property a must for couples who are seeking a romantic weekend getaway. For the celeb or those who require privacy, there are also two 500-square foot bungalows tastefully designed with a private guest entrance. If you are seeking seclusion, you will enjoy the ‘stylish comfort, luxury and panoramic views of picturesque Lake La Quinta and the surrounding mountains. This is especially picturesque during the winter with the snow capped mountains in the distance. The piece de la resistance is the fine dining at the restaurant, Melange. You don’t have to step away from this charming property because Chef Nestor Ruiz has tastefully designed family farm-sourced ingredients and offers a menu of classic and contemporary dishes. 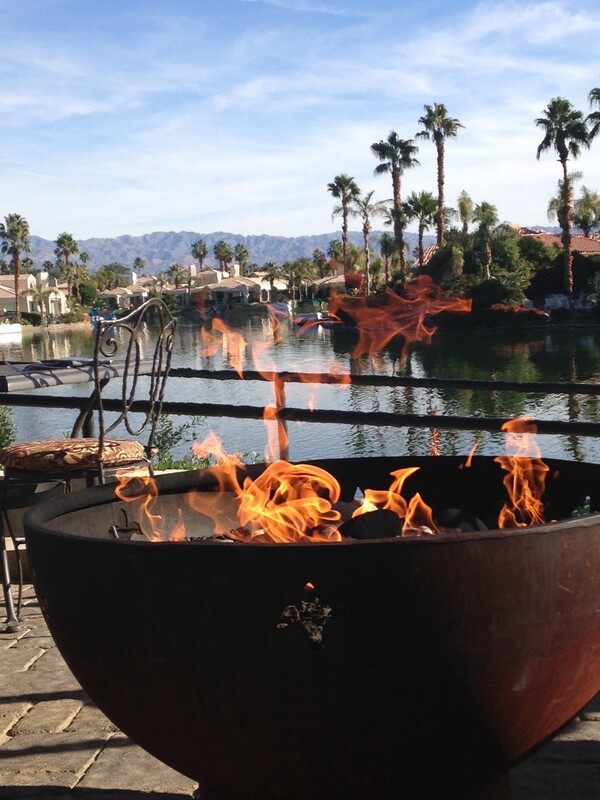 The outdoor patio is replete with fire pits for a year round dramatic dining experience. The menu is diversified for the most distinguished palate. There are also monthly wine pairing dinners, a rotating series that pairs wines from California’s top vintners alongside custom dishes. To say that some just come for the gourmet dining is true, but once you experience the property, you will definitely want to book an overnight stay in one of the 24 suites. In fact, the special experiences for a couples retreat can’t be beat! It is a perfect setting for your next event-including small weddings or up to 250 guests where you can book the whole property. Romance is in the air, while reminiscent of a private European chateau on a lake, this is truly a tasteful and lovely spot. Come dine, visit and make a it special occasion. The staff loves to join in! From a rendezvous to a repeat performance- ‘same time next year’ spot or take the next step to an engagement surprise, and then make plans for the wedding! Yoga De-stress-If you’re a yoga buff, seeking a great class, there’s a fab studio nearby in La Quinta to get your daily dose. Evolve Yoga is a studio with a unique blend of classes like meditation or a Reiki and Flow, combining different aspects for healing and expanding your practice. The future is bright for luxury travel with your best friend, especially in the Palm Springs area! This historic resort playground has always been a favorite escape for snowbirds and big Hollywood Honchos, where guests can explore five PGA golf courses, plus boating, hiking, horseback riding, hot air balloon tours, fishing and mountain biking. The Living Desert, Palm Springs and Joshua Tree National Park are also within reach. Marjorie Hope Rothstein has been a passionate seeker of fine living through the art of self-care. As a spa trends specialist, she has traveled the globe researching the latest in health and wellness, natural health and beauty treatments. A spa maven with a penchant for seeking Beauty For The Soul has led her to discover the true balance of the mind/body/spirit with several key elements that contribute to life enhancement. From leading edge wellness travel and spas, traditional massages, to indigenous treatments, she’s tried it all! From Bali to Phuket and right around the corner in Los Angeles, healing retreats and spas are de rigueur for anyone who is seeking to de-stress in this ever increasing chaotic world. As the former spa editor of Malibu Magazine, huffingtonpost.com, justluxe.com and The Los Angeles Examiner.com/Fountain of Youth, Spa and Travel, she had the opportunity to visit some of the best of the best in luxury pampering focused on natural healing modalities. As the founder of Living the 5 Star Life...without limits, she is dedicated to researching and discovering the absolute best of the best in products, services and resources that make a difference. As a BoomerBabe with her finger on the pulse of the latest leading edge breakthroughs in beauty and preventative health and wellness, she is passionate about finding and sharing her discoveries of the fountain of youth with her readers. HAPPY PAW-LIDAYS …Tips To Keep Travel With Your Pet Merry!